At Sun Lakes United Methodist Church we have a wonderful group of ladies who enjoy making things with their hands! They get together once a week on Monday afternoons to knit, glue, sew and “natter” to their heart’s content! Ready for the Fall Bazaar! 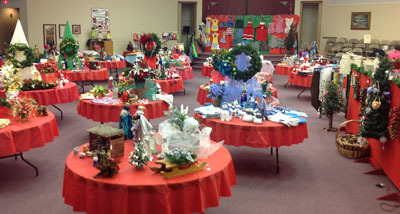 The craft items they make all year- round are sold at the annual Fall Sale in October for our members following the 8:15 a.m. Worship service – with the proceeds benefiting the Church where needed. Items sold include lots of Fall decorations, placemats, hats, scarves, home decor, and their “famous” jalapeno jelly which everyone raves about, just to name a few. They also hold a Church Bazaar in November, from 8 a.m. to 2 p.m. This one is open to everyone – so please bring your friends with you for their Christmas shopping! The ladies hold a fabulous Bake Sale at this event with all sorts of yummy edibles to purchase. You’d better come early as they sell out pretty quickly. The Krafters’ main goal is to share in Christian fellowship as they give of their time, talents, and money to various ministries of the Church. 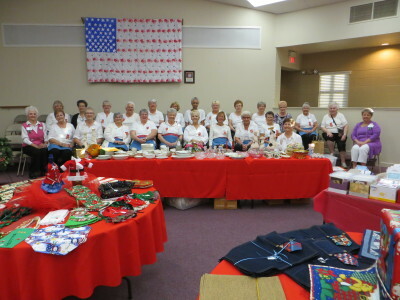 They work during the year on various craft and sewing projects to create items for the annual fall sale in October and their main Church Bazaar in early November. If this sounds like the kind of group you would enjoy getting involved with, you should visit their fantastically organized craft-room located on the lower level of the Education Building on a Monday afternoon, or contact Pat Andersen for more information.